“Baby Wants Candy,” has long been a favorite of ours here at ChiIL Live Shows. I came from an improv background, studying it in high school and college in the 80's and forming my own nationally award winning troupe at Miami University in Oxford, Ohio. They lasted over 20 years. I've always had a soft spot for imrov done well, and Baby Wants Candy delivers. This talented troupe not only takes audience suggestions for dialogue and show theme, but they put on a full on musical with a live band! You've got to see it to believe it. Chicago’s celebrated comedy institution will be spending the winter at Judy’s Beat Lounge at The Second City Training Center (230 W. North Ave) for a limited run, starting January 7 and running through March 25, 2017. After beginning at Improv Olympic and moving to the Apollo Theater in 2005, the “truly amazing” (New York Times) and “consistently funny and crowd pleasing” (Chicago Sun-Times) improvised musical will now perform every Saturday at 9 p.m. at the Training Center’s intimate 60-seat theater. Featuring a full band, each performance comes to life with a call-out by the audience resulting in a 60-minute, fully-improvised musical by some of Chicago’s finest improvisers. Tickets to “Baby Wants Candy” ($15/general admission; $7/students) are on sale now and can be purchased by visiting SecondCity.com. Each “Baby Wants Candy” performance begins with the cast asking the audience for a suggestion of a musical that has never been performed before. In that moment, accompanied by a full band, the first title that the group hears becomes the title and theme for that evening’s improvised musical, featuring a roller coaster ride of spontaneously choreographed dance numbers, rhyming verses and improvised comedy. Each performance is its own opening and closing night, and by design every show is completely unique and a once–in a lifetime premiere. The cast of “Baby Wants Candy” includes seasoned improv vets Erica Elam (Goodman Theatre, Steppenwolf Theatre Company, Chicago Tribune’s “One of Top Five Actors to Watch”), Nick Semar (“50 Shades! The Musical” National Tour), Ross Taylor, Nicole Hastings and Maria Randazzo (Second City Tour Company) and more, with musical direction by Jesse Case (Second City Mainstage & e.t.c., “Shamilton,” “Longer, Louder, Wagner!”). Performances of “Baby Wants Candy” run every Saturday night at 9 p.m. from January 7 – March 25, 2017. Since its inception, “Baby Wants Candy” has expanded to include performing companies in Chicago, New York and Los Angeles, as well as an international touring company, creating more than 3,000 completely improvised musicals to sold-out crowds all over the world. In addition to weekly performances in Chicago, they also perform regularly at Upright Citizens Brigade (UCB) in LA. “Baby Wants Candy” performs annual to sold-out audiences at Edinburgh Fringe Festival, and will travel to Australia for a month long run at the Adelaide Fringe Festival in February 2017. For more information about “Baby Wants Candy,” visit the website, or follow them on Facebook and Twitter. “Baby Wants Candy” has received rave reviews in The New York Times, The Huffington Post, The Onion, Chicago Sun-Times, TimeOut New York and more, and has received numerous awards including the winner of FringeNYC’s Outstanding Unique Theatrical Experience, Best Improv Ensemble by Chicago Magazine, the Best Visiting Comedy Ensemble by TimeOut New York, the recipient of the Ensemble of the Year Award at the Chicago Improv Festival, and a rare Sixth Star Award at the Edinburgh Fringe Festival. 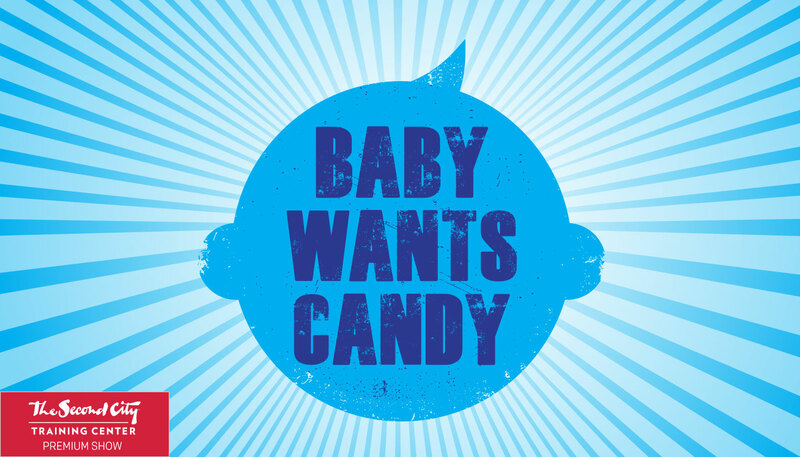 “Baby Wants Candy” has included several notable performers including Peter Gwinn of “Colbert Report;” Aidy Bryant of “Saturday Night Live;” Stephnie Weir of “MadTV;” Nicole Parker of “MadTV” and Elphaba in “Wicked” on Broadway; Jack McBrayer of “30 Rock;” Al Samuels and Kevin Fleming of “Sports Action Team;” Thomas Middleditch of “Silicon Valley;” Garry W. Tallent of Bruce Springsteen and the E Street Band; Mark Pender of The Max Weinberg 7 and Bruce Springsteen and the Seeger Sessions Band; and Johnny Pisano of the Jesse Malin Band and The Marky Ramone Band. Members of “Baby Wants Candy” have recently written the hit off-Broadway show “50 Shades! The Musical Parody”. The producing team behind “Baby Wants Candy” debuted “50 Shades! The Musical Parody” in 2012, playing to sold-out crowds off-Broadway, nationally and internationally. “50 Shades” currently runs in Las Vegas and Japan, and has been translated into more than 12 languages. In 2015, Baby Wants Candy also produced “Thrones! The Musical Parody,” opening to sold-out performances at the Edinburgh Fringe Festival, followed by a twice-extended run at the Apollo Theater in Chicago as well as the Hudson Theater in Los Angeles. After previews in Los Angeles last spring, “Baby Wants Candy” brings “Shamilton,” the newest improvised musical based on the Broadway smash hit, to Apollo Theater running January 20 – March 31, 2017.